Need some ideas on how to start your incentive program? Or if you’re looking for what it can do, here’s some incentive program examples you can read that generates the best ROI. Customer incentives can take many forms. They could be reward points or discounts for loyal customers, or referrals. Sometimes, it means advance access to newly released products or freebies. It does not matter what form the incentives take. We need to think about their ripple effect. What rewards are most popular in recognition programs? What kind of incentive programs are there? What kind of incentive programs should you offer? What incentive programs are producing the greatest ROI for companies? A customer incentive program will help your customers to feel more appreciated, and connect emotionally with your brand. As well as share the same values your brand espouses. The customers will, therefore, make repeat purchases, an aspect of customer retention. Incentive programs also have a ripple effect of increasing customer patience in the event of an unfortunate experience with your brand, for example, like with brand recall. Customer incentive programs are a way to collect customer data in exchange for a benefit for the customer. If customers are to be asked to share their personal data, they may be unwilling to do so. But, if a customer benefits from it, like with an incentive program, they might be more willing to give you their personal data to sign up. The data can then be used for insights into customer purchase behavior and to personalize customer experience, as well as creating highly targeted marketing campaigns. Existing customers spend more than new customers. In the US, 40% of revenue comes from returning or repeat purchasers, who represent only 8% of all website visitors. Since you already have the customer data, you can target them appropriately based on their purchase behavior. For example, you can target new product releases for week 3 in the month to customers who purchase more towards the end of the month. This will increase the chances of the customers including your new product when planning for their monthly expenditure. There are several factors come into play for a customer incentive program to be successful. While these factors should be considered, it should be noted that the reward is still important. As it is what will help the customers decide to enroll for the incentive or loyalty program in the first place. Different customers will be drawn by different incentives, financial rewards, or a focus on the customer’s need. Demographics like age also determine the incentives that will attract different customer segments. Millennials value personalization and supporting causes, according to this Accenture research. This means that you want to go for rewards that incorporate what your customers value. Let’s now look at the most popular rewards in customer incentive programs. You may need to combine them in order to engage with different customer segments. Why not look at an example here? Uber launched Uber Rewards in November 2018 beginning with 9 cities in the US. 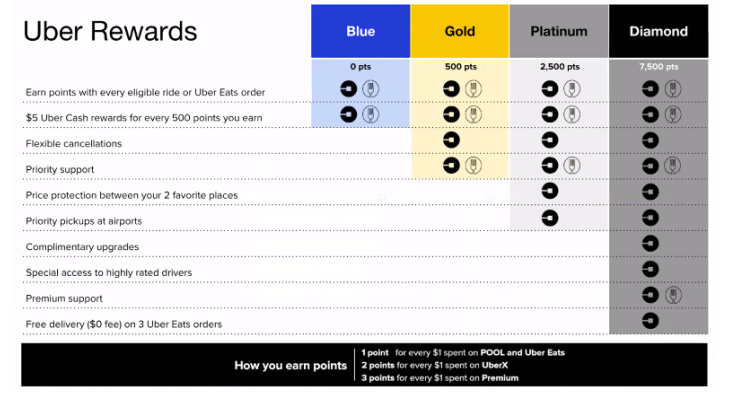 Uber users will earn points on the various Uber products (Uber Pool, Uber Eats, UberX, and luxury Uber rides). The points are based on tiers and will accumulate to take users from one tier to the other. The most basic tier is Blue. When you get to 500 points, you move to the next tier, Gold. 2500 points get you to Platinum, and 7500 to Diamond. Each tier has different benefits, from Uber cash, where $5 is added to your cash balance, which means you pay less; priority support, and flexible cancellations, among others. These are more popular in the hospitality industry and are used together with customer reward programs. An example is the Starbucks app. The app can be used for order placement and payment, and access to streamed music. Note that you do not leave the app since the payment system is integrated into the app. You earn stars for money spent via the app (2 stars for every $1). The stars add up to rewards that can be redeemed for food or drinks. A good example here is Amazon Prime. This program allows for benefits like fast shipping (to street addresses bordering the US). It could be as fast as next day shipping. Members can also order merchandise for delivery to other addresses other than their own for free. Other benefits include unlimited movie and TV show streaming (commercial free), thousands of books that can be borrowed or read for free for those members who own Kindle devices, and even digital photo storage. Remember, all these benefits are at an annual fee of $79. The benefits are clearly more than the users pay for in their annual subscription offering something of great value to the user. This may not sound like a reward in itself, but it is to some extent. Let’s delve more into it. Sephora, one of the biggest beauty brands with about 300 brands has taken personalization to a new level. The brand is able to create customized newsletters and delivers web pages based on their rewards program, Beauty Insider. The brand uses insights from individual purchase history on the reward program to deliver external web pages. Moreover, customers create customized profiles based on their skin type and age, preferences and other criteria used in the beauty industry. Users can customize their beauty profiles the way they like. The profiles make it easier for the brand to give appropriate freebies, beauty products, makeovers, and services. These, like personalization, may not be rewards, from phase value. But think about it. If all the reward program is about is points accumulation, it may get monotonous and boring for your customers. You may see customers dropping off and disengaging from the loyalty program. Mystery, wonder, and a sense of surprise need to be classified as rewards too. An example here is Swarm, an app that keeps a record of visited places. Users earn discounts for check-ins at particular locations. There are weekly contests where users can participate to win shopping trips or vacations. The best part is that the users may just walk into a participating location, unknowingly and win a dream vacation or a reward that was totally unexpected. When a user shares their location, they get to see nearby friends. This may be a great opportunity to connect with a long lost friend (bonus incentive). There are different types of customer incentive programs. We will look at each so that you can determine which one would work well for your business and customers. You may find that you need to combine several types in order to reach a particular customer segment or to keep your customers engaged. This is the most popular rewards program type. The customer accumulates points for a particular behavior, like making a purchase, or in store-visits. Sometimes, the points are earned when a particular platform, a website or app is used, or even for non-transactional behavior, signing up an email, spending a night in a hotel (hospitality), following the brand on their social media profiles (liking the pages), and downloading an app. The points are then translated into rewards. The rewards depend on the business. It could be the brand’s products or services, or discounts. An example here would be Topps Now. Where you earn points that can be traded in for dollars off a purchase. You can earn points for signing up for the reward program, having a birthday, making a referral, following on social sites, and of course making purchases. This is an approach that uses several touch points in order to reward customers across multiple channels, spending in-store, on an app, sharing social media content, referrals, and reading emails. The approach uses customer data to help personalize messaging and customer experiences. Customers stay engaged and informed about the brand’s activities, increasing customer retention and expenditure. An example is Tarte’s reward program where the users are known as tartelettes. Brands partner with other brands to offer their customers more value than they would on their own. An example of partnership is the Wyndham Rewards Program, which was crowned the best hotel loyalty program in the USA Today 10 Best Readers’ Choice Awards, 2018. The program has over $50 million users. Members earn points and redeem them for a free night stay across 25,000 Wyndham hotels worldwide, based on their membership levels. The brand also works with other hotel brands. 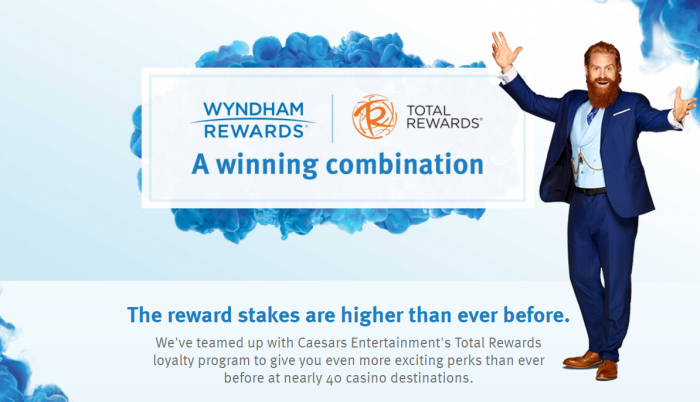 In 2017, Wyndham partnered with Caesar Entertainment’s reward program, “Total rewards” where users of any of the reward programs (Wyndham or Caesar) could log in and have their “status” matched. The users could then transfer their credits and enjoy benefits from either brand. This can be seen as an advanced version of the points reward program. This model allows for the customers in higher tiers to receive better rewards and decreases the amount of time customers have to wait in order to start receiving awards. Customers tend to spend more in order to reach the higher tiers and gain better rewards. An example here is Zappos Rewards which has 4 tiers: Silver (0-1199 points), Gold (1200 to 5999 points), Platinum (6000 points) and Elite (invite only). Each of these tiers has different benefits, and the benefits increase as the users move up the tiers. 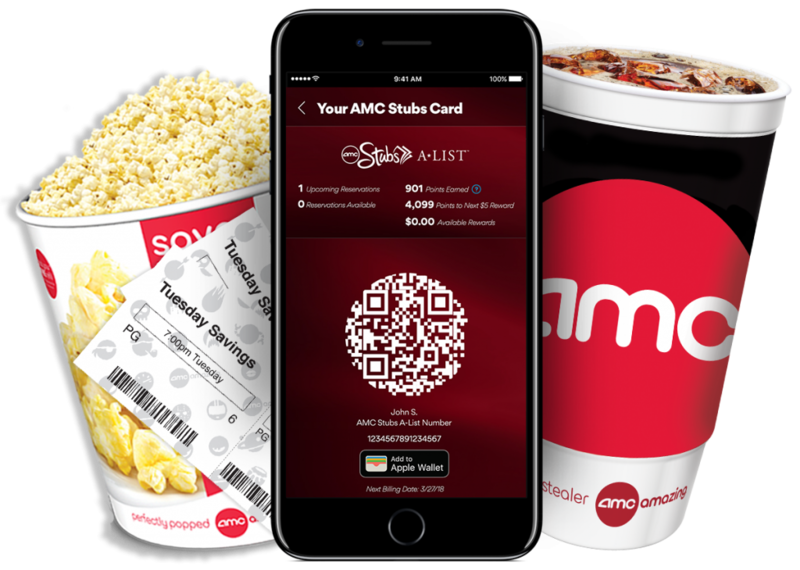 IMAX® g. Members who upgrade to AMC Stubs Premiere get additional benefits like $5 back for $50 spent, free popcorn and fountain drink, and even priority lanes at the box office. As you may have noticed, even where specific reward program types have been used, there is integration with other types of reward programs. It can difficult to exclusively use only one type. A combination of the different types will achieve more desirable results as we have already seen. We have just looked at the different reward programs that exist and mentioned that you need to combine at least two for more desirable results. We will briefly look at what your reward program should offer no matter what type it is. Your program needs to be simple to understand, sign up, and use. Otherwise the customers will get bored. Simplicity should also boil down to how rewards accumulate. There is no need for customers to keep entering a coupon code in or PIN in order to see what rewards they are qualified for. Moreover, your program needs to be easy to use mobile devices, user-friendly, and seamless. Your reward program needs to give real rewards that customers can actually benefit from. The customers need to see the value that being part of your rewards program brings them, how it saves them money. We have already looked at the different rewards that you could go for. There are many customer reward programs. Why would customers sign up for your brand’s and not another brand’s? The most successful programs have an element of surprise, wonder, and mystery. You want your customers to keep coming back for more. If the program gets monotonous, then customers will drop out. You need to continuously engage your customers in order for them to continuously participate. Reward them even for non-purchase actions like sharing your content on social media. You may also need to add a bit of urgency to your reward program. You could have a points expiration date, for example. This will push your users a little in order to use the points before they expire. In using the points, they could earn more rewards for being active. Regular reminders to remain active and use their points are also a way to encourage your users to remain active. Users need to emotionally connect with your reward program. They should feel that the program is not just there to try and get them to spend more. They need to feel that the program benefits them and not just you. The rewards should ideally get better as your customers become more loyal or active. This could be defined by the amount of money spent on your brand or number of purchases. As the customer buys more, they should get better rewards as it incentivizes them to return again. Users will not always fully understand your program, no matter how much you simplify it. Customer support is vital to your business growth and you need to have an efficient system to handle their queries. Another reason why you would need to put heavy focus on customer support is to initiate relationship marketing with your customer. According to Gallup’s customer database, half of all customers (50%) say they are satisfied with a given brand, but only 38% of customers say they are engaged with one. If you want serious ROI, just imagine incentivizing highly engaged customers and see what happens. In this section, we will look at some of the highest performing customer reward programs. You could learn a thing or two that you can implement in your own program. This program boasts of over 80 million active users. 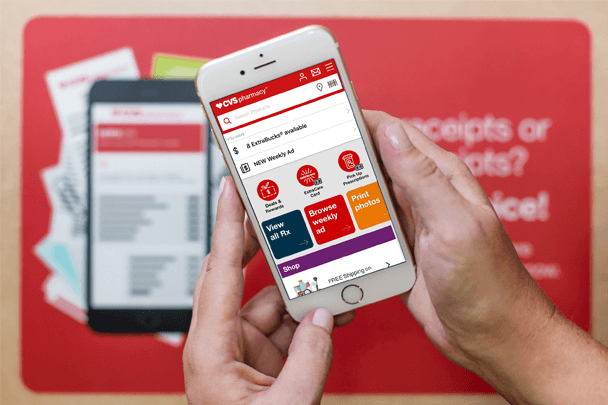 The CVS app has been downloaded over 19 million times. One in every 4 US households uses ExtraCare. These statistics are a simple illustration of the kind of ROI a loyalty program can bring. The National Car Rental company rewards its users through the Emerald Exchange Club, which is a private, online community. The approach that the Emerald club is feedback from their customers about their Car Rental experiences, usually through photos and videos. The members in exchange earn rental credits for qualified car rentals, a free rental day when they reach 7 credits, and can get to choose any car (midsize and above) and pay the midsize rate, among other benefits. The active Emerald membership has increased by 27% since the launch of the program and the company’s revenue increased by 32%. This is one of the most unique loyalty programs. Patagonia’s customers get to resell their Patagonia clothing via the brand’s site. 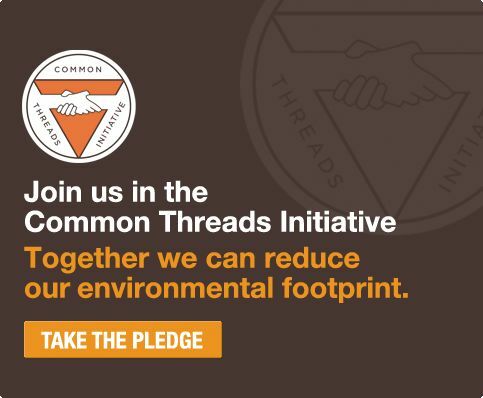 The customers, through the Common Threads Pledge buy pre-owned gear and re-sell it when they no longer need or want them. This emphasizes the brand’s message of durability while benefiting the customers. One could re-sell the brand’s clothing and use the money made towards purchasing brand new clothing. The initiative has over 70,000 subscribers, and over 57,000 items have been sold thus far. The initiative is also environmentally conscious which makes it even more appealing. We have looked at various aspects of customer incentive programs: what they can do for you, the most popular rewards, the types of incentive programs, what your reward program should offer, and examples of reward programs with high ROI. It is now time to start thinking about your reward program, and how it can best serve you and your customers.